Bristol Lodge in Waltham, MA provides meals daily to 60 – 110 individuals who are homeless. Redeemer has cooked, delivered and served a meal once per month throughout for over a decade at Bristol Lodge. We usually cook and serve on the 4th Monday of the month. Lex Eat Together offers a free weekly meal to anyone in our Lexington community would would benefit from a nutritious meal and companionship. Dinner is served every Wednesday at 5:15pm to 6:30pm in the Church's Great Hall at 6 Meriam Street. Lex Eat together seeks to alleviate the hunger and social isolation that many in our midst experience, in a welcoming and convivial environment. Volunteers prepare and serve dinner tableside to our guests, who range from young families through seniors. To learn more or to volunteer, please visit www.lexeattogether.org. Adults and teens are invited to join the yearly mission trip to St. Christopher's Mission in Bluff, Utah. The 2018 Mission team helped with the upkeep of the mission, organized museum exhibits, installed new computers, poured concrete for a handicapped ramp, and cleaned up the playground area. We also spent time in fellowship with the Navajo members of St. Christopher's and learned about life on the Navajo reservation. Esperanza Academy is a tuition-free, independent middle school in the Episcopal tradition welcoming girls of diverse faiths, races, and cultures from Lawrence, Massachusetts. We support Esperanza Academy with work days and our “Everything but the Teacher” Fall school supplies drive. We also sponsor their annual Science Fair and members of Redeemer who are women scientists are the judges for the fair. The Grow Clinic at the Boston Medical Center provides assistance to infants who have "Failure to Thrive". Redeemer provides financial support, an annual Christmas party for families, and needed supplies through our "Everything but the Baby" supplies drive. We send work teams twice a year to the Lawrence, MA branch of Habitat for Humanity. The Food Pantry operates out of Redeemer’s basement every Saturday morning throughout the year. In addition, the annual Pancake Breakfast on Patriot’s Day raises approximately $3000 for the Food Pantry. Lexington’s Interfaith Garden, located near the Battle Green in Lexington Center, donates all of its produce to local food pantries and hunger relief programs. Volunteers of all ages from over fourteen faith communities, including Redeemer, work and learn together while planting, tending and harvesting organically grown produce. We are also growing community – between the faith communities who are working beside one another in the garden and with our good neighbors who receive the food from the garden. Learn more at the Interfaith Garden website. 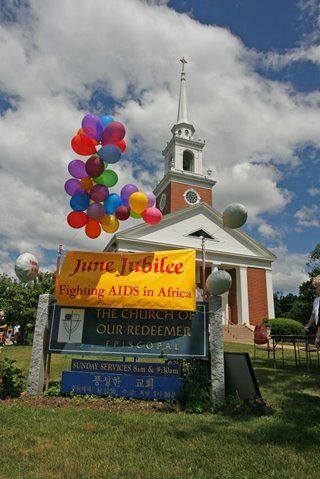 Redeemer's Giving Garden is located on-site at the church. Started in 2010, the Giving Garden serves multiple functions. It is a hands-on classroom for our children who plant the seedlings each May and it produces nutritious organic vegetables and herbs for clients of the Interfaith Food Pantry and Bristol Lodge. We invite you to volunteer for one week this summer to help us tend the garden. All are welcome. The Patriot's Day Pancake Breakfast is a fun all-parish event that raises money for local charities. Each year we serve nearly 500 visitors pancakes after the re-enactment of the Battle of Lexington on the Green next door to Redeemer. refugees and asylum seekers to integrate into American society.